Growth in mortgages in the banking sector slipped to 11.4% year-on-year (y-o-y) in October from 12.8% in September, data released by the Reserve Bank of India (RBI) on Thursday showed. Growth in mortgages in the banking sector slipped to 11.4% year-on-year (y-o-y) in October from 12.8% in September, data released by the Reserve Bank of India (RBI) on Thursday showed. Home-loan outstandings at banks had grown 16.6% y-o-y in October 2016. The total outstanding on mortgages in the banking system stood at Rs 9.03 lakh crore as on October 27 this year. Retail loans as a category grew 16% y-o-y in October, a shade slower than 17% in October 2016. Outstanding retail loans as on October 27 stood at Rs 17.45 lakh crore. Loans to individuals had been clocking growth figures in the mid-to-late teens since May 2015, before signs of a slowdown began to surface in November 2016. In September, outstandings on credit cards grew the most, at 37.7%, among all categories of loans to individuals. Vehicle loans grew 7.4%, significantly slower than 23.5% in September 2016, while consumer-durable loans dropped 9.4%, as compared to a year-ago growth figure of 20.3%. Credit to industry contracted on a y-o-y basis for the thirteenth straight month in October, falling 0.2% y-o-y to Rs 26 lakh crore. In October 2016, the corresponding figure stood at Rs 26.05 lakh crore, 1.7% lower than the October 2015 level. Industrial credit has been falling almost consistently since August 2016, with September 2016 being the only month of positive growth ever since. Credit deployment in industry fell 13.5% y-o-y in the medium industry segment. However, loans to large industry and micro-and-small industry recorded positive growth, rising 0.2% and 1.2%, respectively, over the year-ago period. Bank credit to industry has been muted for the past couple of years as lenders turned cautious amid worsening asset quality and well-rated corporates chose to raise money from the bond market. Loan growth has been suffering partly due to capital-starved public sector banks. Analysts expect the recapitalisation of state-owned banks to fuel credit growth in the months ahead. In a recent note, Kotak Institutional Equities wrote that lenders like Bank of Baroda, Canara Bank and Union Bank of India should see loan growth improving. “Loan growth for PSU banks is also partly supported by loan buy-outs from NBFCs and private banks. Retail cycle continues to hold up well, prompting many banks to pursue this segment more aggressively,” Kotak said. Trends in the corporate loan growth appear anaemic, according to the brokerage, with few signs of a turn in the capex cycle. 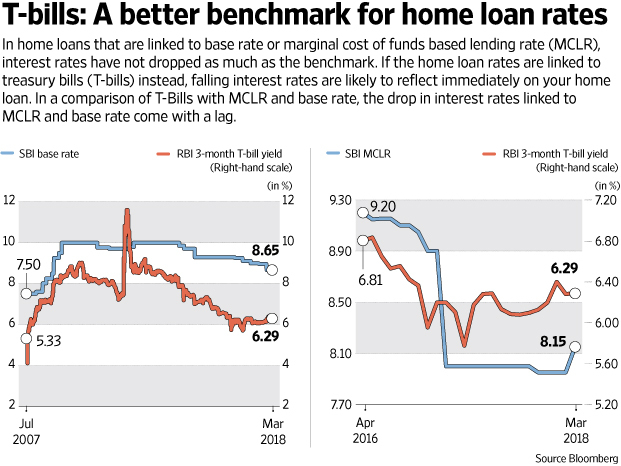 MUMBAI: A Reserve Bank of India appointed committee on Household Finance has suggested that banks link their home loan rates to the RBI’s repo rate, the rate at which it lends to banks, instead of the Marginal Cost of Funds based Lending Rate (MCLR), which the banks follow now. While these recommendations need not be accepted by the regulator, it comes when the RBI had hinted it was unhappy with the rate transmission under the MCLR regime. In the past three years the central bank has reduced the policy rate by 200 basis points, but the weighted average lending rates have fallen by 145 basis points. A basis point is 0.01 percentage point. The committee has also recommended that all banks use the same reset period of one month for loans. Under the current system, floating rate loans have a fixation period of roughly one year. The report argues that the current system impedes monetary transmission mechanism and does not allow borrowers to immediately benefit from interest rate drops. “If the bank decides to link home loans to the one-year MCLR, it should pass through any changes in the one-year MCLR rate to borrowers every month,” the report says. “And if the bank decides to link home loans to the six-month MCLR, it should pass through any changes in the six-month MCLR rate to borrowers every month.